The Fiat 500, commonly known as "Topolino", was manufactured by Fiat from 1936 to 1955. The Topolino was one of the smallest cars in the world at the time of its production. Three models were produced until 1955, all with only minor mechanical and cosmetic changes. It all started from an idea of Benito Mussolini. In 1930, the Duce had called Senator of the Kingdom of Italy Giovanni Agnelli to inform him of the "absolute necessity" to motorize Italians with an economic car that did not exceed the cost of 5,000 lire. The task was put in the hands of 29 years old Dante Giocosa an aeronautical engineer who’s career with FIAT started in 1928. His work would cover the mechanical content of the car – engine, transmission and chassis. Rudolfo Schaffer, FIAT’s resident coachwork engineer was to design the body at the same time. In the post-war years Fioravante Zanussi race-prepared several small-capacity cars for private drivers, mainly using Fiat, Alfa Romeo and BMW engines. This barchetta was built on a Fiat 500 B chassis by Fioravante Zanussi in 1948. It was fitted out in a barchetta sport, in aluminum, by Tullio Vendrame of Mareno di Piave (Treviso). This particular sport barchetta is the only remaining of three built with this particular front and it is the only uprated by Antonio Fontebasso, the first owner together Diego Zanotto. Fontebasso wanted to participate in several races. 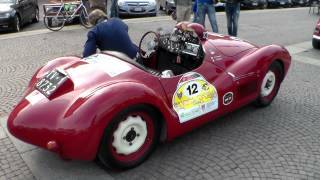 The work was completed in 1948 and the car ran the Coppa d'Oro delle Dolomiti in 1949 and in 1950. In this period Fontebasso decided to emigrate to Brazil and the car was driver by the co-owner Diego Zanotto. It was probably fitted with a 500cc engine with a Siata cylinder head. The original engine was replaced with an engine Lancia Ardea reduced to 750cc in an uncertain date in the past.